In recognition of Fair Trade Month, Marigold Fair Trade Clothing has a new blog series entitled: “Fair Trade From the Seed to the Consumer.” Our beautiful, fashion-forward products represent a completely fair trade supply chain, and you can be assured that from the cotton seed to the finished product, your Marigold purchase is helping to transform the lives of workers and their communities. Holding true to our value of transparency, and in an effort to educate and advocate for the Fair Trade model, we are opening up, and explaining, our complete value chain to the consumer public. The org anic cotton used to make Marigold products is milled, ginned and dyed by an association of over 5,000 farmers in the Indian states of Andhra Pradesh and Maharashtra, and then the finished cotton fabric is sent to the cooperative for stitching. In order to make the beautiful, one of a kind products that you have come to love, we use fabrics that are vegetable-dyed and hand block printed, bringing the past into today’s fashion conscious world. 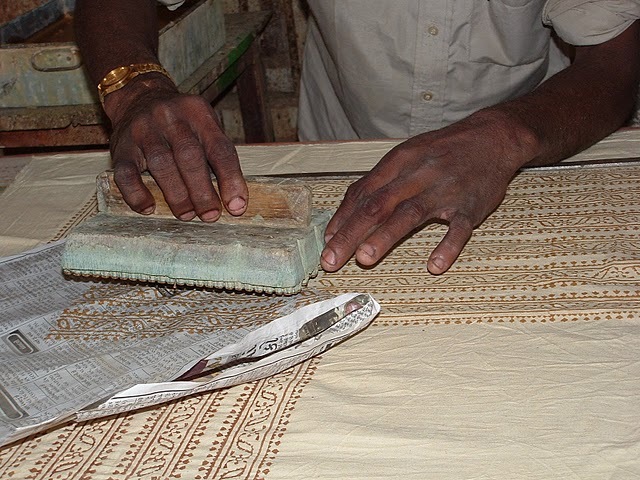 Hand block printing is an age-old tradition that dates back to 12th century India, but it is a dying art form due to the trend of mass production. We believe in honoring and celebrating this tradition and so the fabrics us ed at the co-op to make Marigold clothing and housewares come from a group of artisans who have been block printing for generations. The work is done by hand with intricately carved wooden blocks called bunta which are pressed into the fabrics with great precision to bring you products that area true work of art. 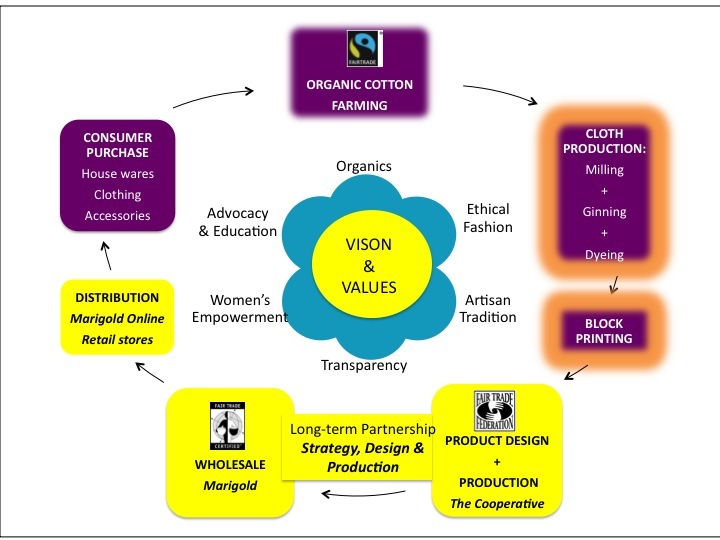 Using a model of a completely fair trade supply chain, everyone who has had a hand in creating a Marigold product is becoming an economically self-sufficient stakeholder, and is not simply a worker. Stay tuned for Part 3: Product Design & Production. In the mean time, what are your thoughts on using artisan traditions (such as block printing and vegetable dying) for the production of consumer goods? Is this important to you? Do you think the general shopper is concerned about the source of their fabrics? Entry filed under: India, Organic cotton, Supply chain. Tags: fabric, fair trade, hand block printing, india, supply chain, vegetable dyed.